Ten years ago, I went to a series of lectures by Deanna Petherbridge called Drawing towards Enquiry at the National Gallery in London in 2006. She is the only person I know who has been both Professor of Drawing at the Royal College of Art and the Arnolfini Professor of Drawing at both the University of the West of England, Bristol and the University of London. Travelling extensively through Europe, India, the Middle East and Far East, her detailed monochrome drawings are inspired by diverse landscapes, cities and cultures: from mathematical patterns of Islamic design, to rustic Umbrian dwellings and Manchester’s industrial cast-iron structures. Detailed geometric studies or free inventions in brush and wash, her distinctive works deal with the impact of colonialism, industrialisation and warfare. Her passionate condemnation of present conflicts is expressed in the 2016 triptych 'The Destruction of the City of Homs'. A new book about drawing Deanna Petherbridge: Drawing and Dialogue has also been published by Circa Press and the launch is this evening. 2010 - The Primacy of Drawing: Histories and Theories of Practice - which I rather think was being trialled at the lecturtes I heard in 2006. The book was certainly underway at that time. 1995 to 2001 - Professor of Drawing at the Royal College of Art from where she launched the Centre for Drawing Research, the first doctoral programme in drawing in the UK and ran an extensive course of drawing workshops and open lectures for the whole college. 2009 to 2012 - Visiting Professor of Drawing at the University of the Arts London. 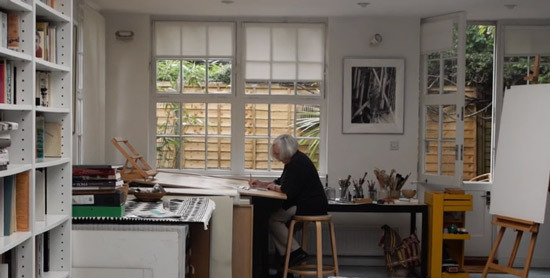 This is a video about Deanna Petherbridge talking about Drawing. She's very articulate and intense and you need to concentrate to follow what she is saying. It's fascinating to hear her talking again ten years after I first heard her talking about drawing. Mickey Mouse and Manga: Drawing and Popular Culture. Just been to the Whitworth, Manchester and was blown away by the Deanna Petherbridge exhibition. I love the architectural style which combines with a sense of place and the more human element. I am not your regular art buff, just know what I like. The detail and technical ability made me want to have one hanging on my wall. If only !!! !